So apparently, the difference between gammon and ham is that gammon is cured as part of a side of bacon (and then smoked or not) and ham is removed from the carcass and smoked or dried. I have never heard the term ‘gammon’ in the US, but I guess it must exist. Here in the UK we quite often buy small gammon joints and roast them in the oven, covered at first and then uncovered to brown the fat. It’s pretty standard fare, but it’s always tasty. This ham was different. I wanted to cook it differently, flavor it differently, do something so that it would be a bit more special. A bit of a treat. Enter the barbecue. I could find no recipe online for a barbecued ham or gammon, no one I mentioned it to had ever tried it or seen any recipe for it. It was looking innovative, but also a bit risky. I thought Chinese flavors would suit the cooking method, especially as I had bought some pak choi over the weekend which, to me, is best when simply grilled and drizzled with sesame oil and salt. Then there were those potatoes I bought the week before, going out of date on the day I bought them, but festering away in the fridge the past seven days. I must admit, I was a bit nervous to see how they had fared when I opened the package. I was pleased to find that they were unmarked by time and perfectly good to eat. Par boiled and then placed in a foil parcel with a sticky dressing to toss them in after cooking would be perfect. A plan was beginning to take shape. I arrived home ready to engage in mission: barbecue gammon. Then we discovered that we had no coals. The hottest day of the year − actually, the hottest day since 2007 − and we had to cook inside, with the oven. Damn. Oh well, the oven it was then. I used the same method as my honey and thyme glazed ham, but I scored and rubbed the fat with Chinese five spice and put a cup of chicken stock in the bottom of the pan rather than apple juice. 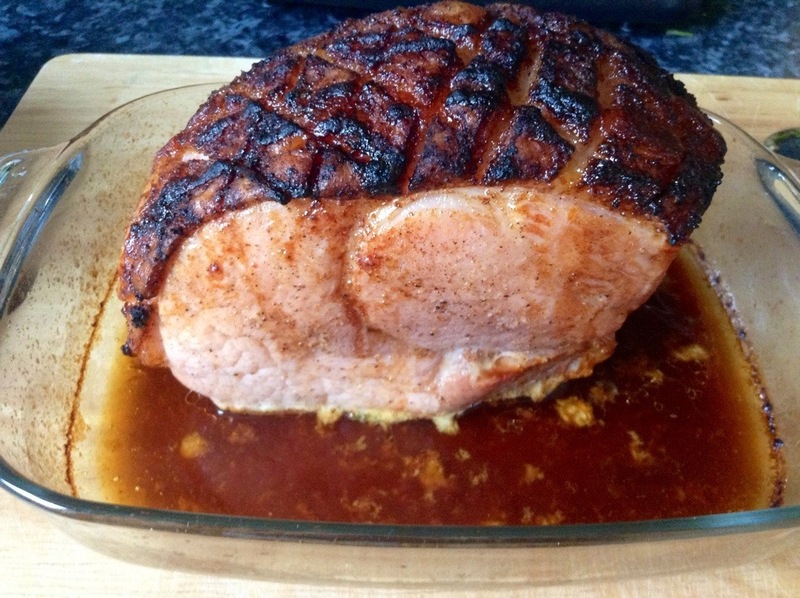 When I removed the foil to brown the fat, I drizzled the gammon with honey, sriracha and a tiny bit of soy sauce – which I think is responsible for that lovely dark finish. 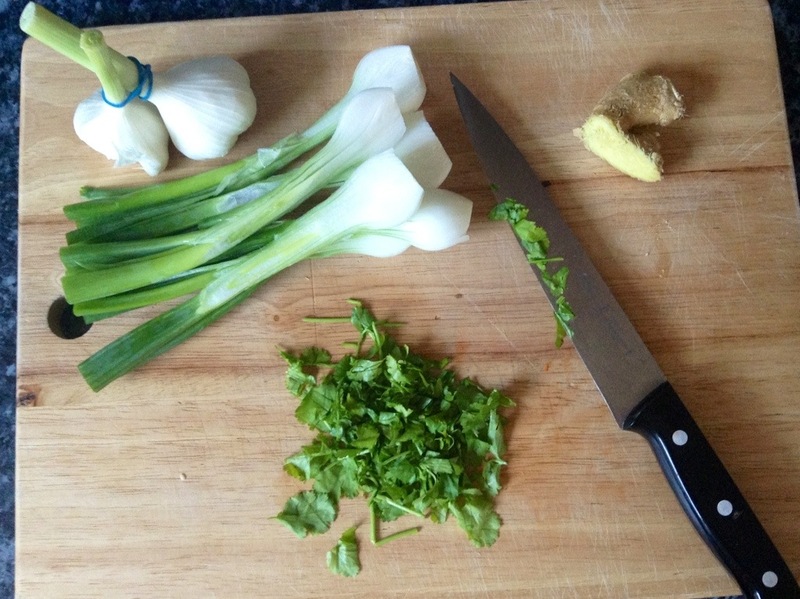 The stovetop grill pan would have to do for the pak choi and spring onions. A few minutes either side on a super hot pan offers the perfect amount of wilt and bringing the juices to the surface to give you the perfect tender green still retaining that freshness so important in summer. The potatoes were a bit of a conundrum. I had these potatoes in the fridge which I needed to use, but for some reason Chinese and potatoes didn’t seem to go together in my head. A short search online convinced me that I was probably wrong. 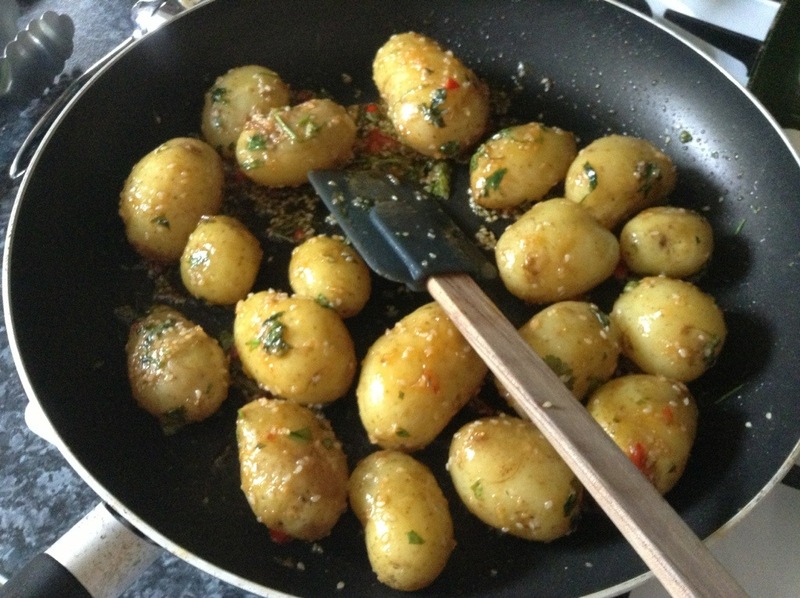 I made a dressing with a combination of honey, sesame oil, sesame seeds, garlic, chilli, ginger and coriander to stickily coat the steaming new potatoes and then gently fried to intensify and caramelize the dressing. They were incredible. This was a super flavorful and well rounded meal, even if it was cooked inside. With a few tweaks it would be equally successful on a barbecue or outdoor grill too, I’m sure. Hopefully there are enough summer days left for me to try it! 1. Preheat oven to 350ºF (180ºC) and score the fat on the gammon and rub with Chinese five spice. 2. Place in a ovenproof dish, a snug one is best, and pour Chicken Stock (or water) into bottom of the dish. 3. Cover tightly with foil and place in over for 30 minutes. 4. Meanwhile, put potatoes in a large saucepan and cover with cold water. Bring to boil and cook for 10 minutes or until they can easily be pierced with a knife. 5. While potatoes are cooking mix together ingredients for dressing and set aside. 6. 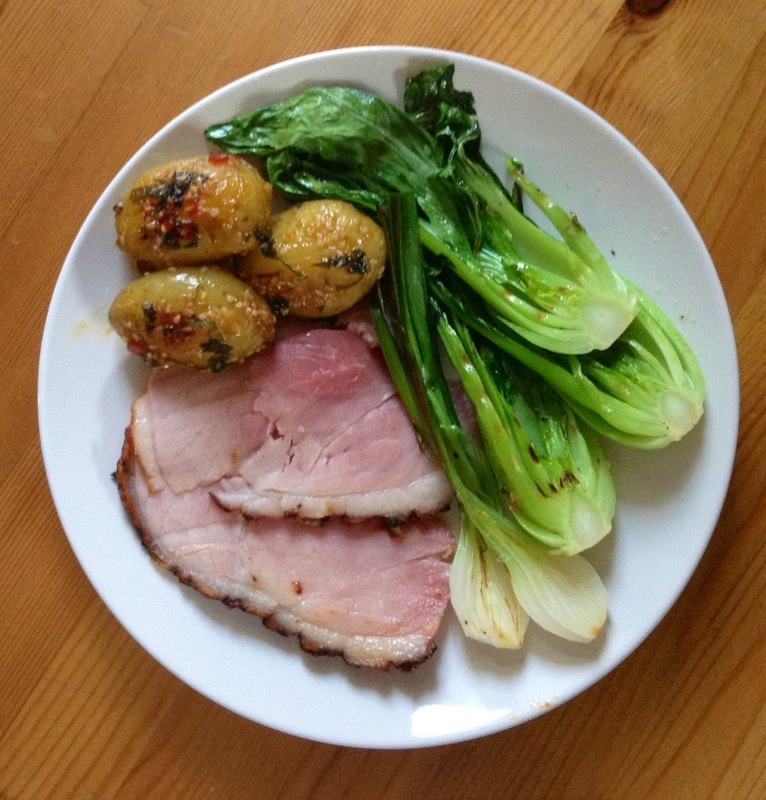 After 30 minutes, remove foil from gammon and drizzle over honey, sriracha and soy sauce. 7. Place back in the oven and cook for 15 minutes or until fat is browned. Remove from oven and rest covered with foil at least 15 minutes. 8. While gammon rests, preheat grill pan on very high heat. 9. Mix potatoes with dressing (you could leave it at this point, but I think caramelizing the dressing slightly gives more flavor) and toss into a shallow frying pan, cooking over medium low heat so you don’t burn the sesame oil or honey. Cook until slightly caramelized and warmed through. 10. 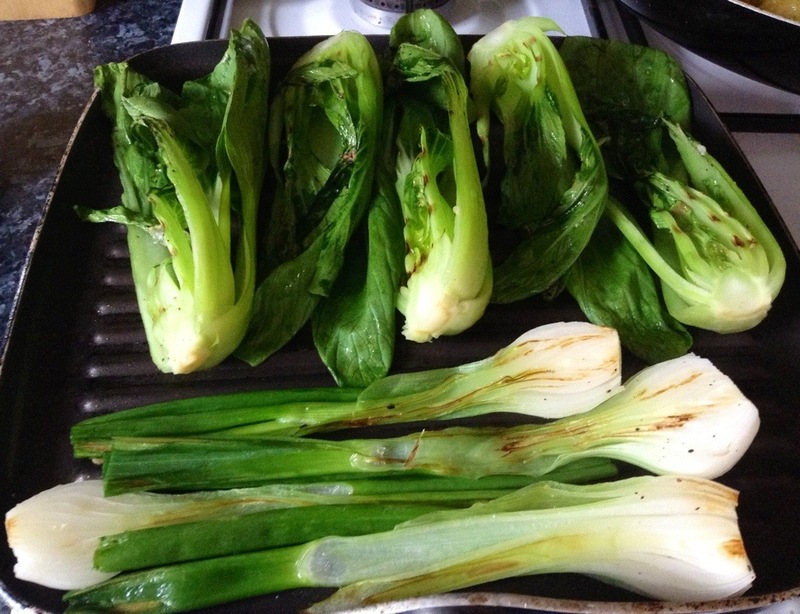 Place pak choi and spring onions, cut side down, onto hot grill pan and grill for 2-3 each side until just browning and wilting. Drizzle with sesame oil. 11. Slice gammon however thick you like and serve! Yeah, who knew? I thought gammon was just what the Brits called ham. Yeah, it was a completely new experience for me and I was pleasantly surprised! The plate and the food look so delicious! Thanks! Can make it for you if we can find gammon in the US! What an elaborate, colorful and scrumptious meal. I really like what you have done to the ham and the potatoes. the Pak Choi goes so perfectly! Greens are probably my favourite food on earth. They’re so colorful, flavorful and different from each other! For me they complete any meal. Fun idea for the potatoes! And those lovely English potatoes. Sigh. I miss them. There’s always something that’s better at home. For me it’s avocados.